Demoger is a star wheel type sorting device that removes MOG (material- than-grapes) from the picked grape before they are deposited in the gondola. Demoger is designed to replace the manual gleaner required on Concord and Niagara harvesters. Some winemakers also require the device to remove unwanted material in the picked mass. Demogers should only be used in harvesters equipped with magnets so smaller metalic objects are kept from the wine press. 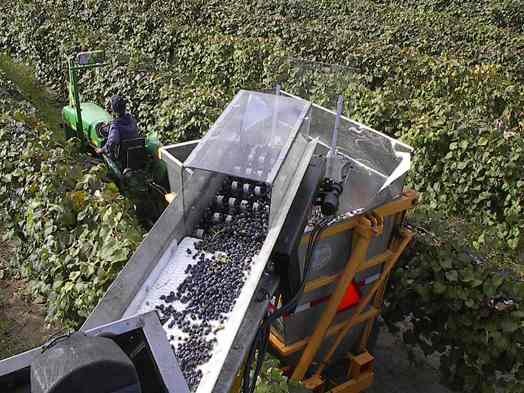 Demogers can be fitted to any make or model of grape harvester and are currently running on AGH Spectrums, UpRight Domestics, BEIs, Nairns, Gregoires and Korvans. If you really want clean grapes, Demoger is the only way to go.